Production Transport provides full service golf cart shuttles. Whether your needs are inside the hall or around the convention center’s perimeter, our courteous drivers are working throughout the day to help your guests get where they need to go. Conventions and tradeshows are exciting times for any industry participants, and people will want to see as many of the exhibitions and scheduled events as possible. We happily provide that solution for your attendees by having golf cart shuttles running throughout the day along pre-designated routes. Simply flag down one of our safety conscious drivers, and we’ll make it fun to move between point A and point B at the venue. We can also make sure that you and your event staff have designated golf cart shuttle service, allowing them to keep your event running as smooth and efficiently as possible. Besides providing the guests with reliable and safe golf cart shuttle service, there are sponsorship opportunities in the form of golf cart toppers! Companies can advertise a specific product, their location at the tradeshow in the form of a booth number, or even an upcoming event. The message will be on display throughout the convention center all day, and any passengers or passerbyers will be able to see. 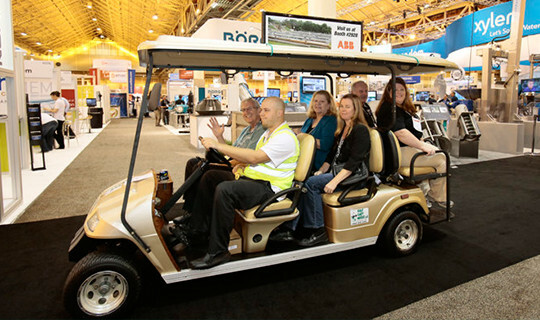 Depending on how many golf cart shuttles are part of your transportation solution, you can offer this option to a number of sponsors at your event. Our team will work with you to create the most engaging, memorable golf cart toppers possible. 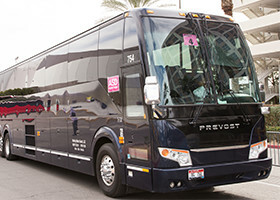 Production Transport has over three decades of experience with the planning and execution of successful large scale event transport, including corporate retreats, tradeshows, and industry conventions. From the initial planning process, to that first airport pickup, and until the last passenger is safely dropped off at their final destination, our team will work tirelessly to ensure a seamless and functioning transportation program. 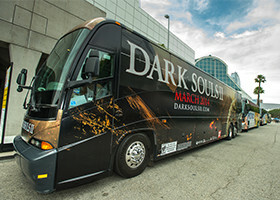 This includes reliable shuttle service and VIP transport options. Let us work with you to create a customized plan for your specific event. Our operations managers will be on site throughout the event coordinating shuttle service. We provide a city wide communication system so that drivers, show managers, and our team can stay in touch. 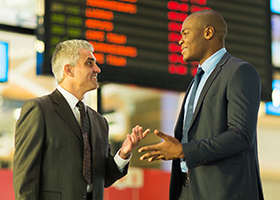 Most of your event attendees will be arriving via commercial airline, and our team will set up a custom meet and greet at various terminals to ensure that they get to their next destination safely and on time. When you gather together tens of thousands of people at once at the same destination, it’s a great opportunity for exhibitors and sponsors to advertise new products, services, or additional event information. We understand that you will have guests attending who need private transportation. 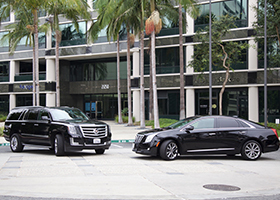 Our VIP fleet of vehicles includes luxury sedans, SUVs, limousines, and we’ll provide transport to a variety of locations.